Installed capacity in the wind energy industry reached 7,369 MW in 2018, an increase of 7.2 percent compared to the previous year. Decreasing costs, thanks to continuously developing technology, have prompted Turkish energy investors to focus their investments in renewable energy in accordance with Turkey's goal to boost the share of local and renewable resources in power generation. As a result of public incentives and private sector efforts, wind power investments have recorded tremendous increases. Last year, investments in this sector totaled $650 million, according to the 2018 Wind Energy Statistics Report released by the Turkish Wind Energy Association (TÜREB). Turkey's wind power installed capacity increased by 497 megawatts (MW). Thus, installed capacity in the wind energy industry reached 7,369 MW, an increase of 7.2 percent. In 2009, the aggregate capacity of wind power plants was recorded at 791.6 MW, a more than ninefold increase in the last nine years. The share of wind power plants in Turkey's total electricity generation was calculated at 6.78 percent on average last year. Meanwhile, the number of wind power plants in operation soared to 180 from 164 last year. As far as the distribution of investments by companies goes, Polat Enerji ranked first with 566 MW, followed by Demirer Enerji with 494 MW and Güriş with 481 MW. In terms of distribution by provinces, İzmir ranked first with 1,405 MW, followed by Balıkesir with 1,123 MW and Manisa with 669 MW. 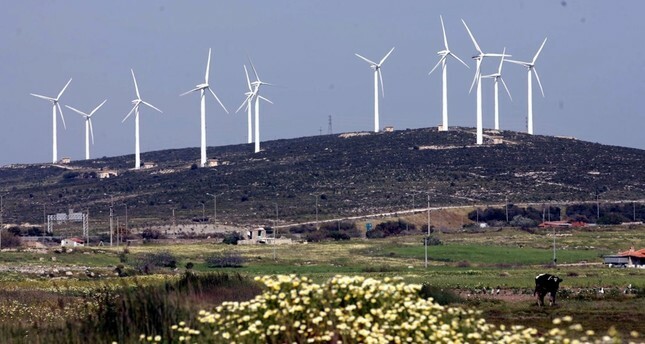 A total of 38 percent of wind power plants in operation is in the Aegean region, 33 percent in the Marmara region, 13 percent in the Mediterranean region and 9 percent in the central Anatolia region. According to the report, a total of 18 wind power plants are currently under construction with a combined capacity of 606 MW, of these plants Akfen Enerji will have the lion's share with 243 MW, followed by Ağaoğlu Enerji at 124 MW and Sancak Enerji with 72 MW. A total of 203 MW projects are under construction in Çanakkale, 124 MW in Balıkesir and 72 MW in İzmir. Assessing the report, TÜREB Chairman Mustafa Serdar Ataseven said economic fluctuations in the world in recent years have had a negative impact on investments. He continued: "That we invested $650 million in the wind power sector in 2018 once again showed what we could do despite challenging conditions. We aimed to create a sustainable sector with our belief that every problem brings an opportunity. We are moving steadily on this path." Pointing out that they have brought their request for capacity increase on the agenda to ensure sustainability, Ataseven said that this request, which will contribute to the industry, has been welcomed and they expect that it will pave the way for industry in a few months. "With the capacity increase, there will be significant acceleration in our installed capacity this year and next year. Then the results of the competitions held at the end of 2017 will begin to come out. Thus, the industry will continue unabated its policy of localization. So far, about $11 billion have been invested in the wind power industry. These investments, which closely concern the future and external dependence of our country, will continue rapidly from now on," he said. According to data from the Energy and Natural Resources Ministry, Turkey's electricity generation was recorded at 292.17 billion kWh in 2018, with a 0.75 percent rise from the previous year. As part of the 2023 vision, Turkey aims to generate 30 percent of its electricity consumption from renewable resources. Within the framework of that goal, Turkey plans to reach 34,000 MW in hydroelectric power, 20,000 in wind power, 5,000 in solar power, 1,000 MW in geothermal power and 1,000 in biomass power capacity. In January this year, the Energy Ministry announced that nearly 60 percent of Turkey's electricity was generated from local resources.